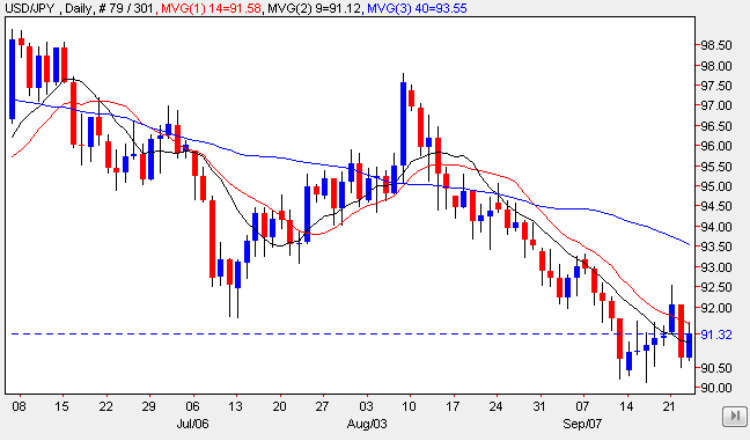 The yen to dollar pair continues to grind lower as the bearish sentiment continues to hold sway, with Tuesday’s wide spread down bar adding further momentum to the move down, with only a minor recovery yesterday, with the pair closing below the 14 day moving average once again. With all three moving averages now pointing lower, and with the bearish engulfing candle now firmly validated in this morning’s early trading, our initial target of 89 is now clearly on the horizon, and should this be breached, then we could see a period of consolidation in the 88 to 89 price level as the yen to dollar pair try to rebase in this region once again. With the trend channel now firmly established on the daily chart for the yen to dollar, and with the Japanes markets now open once again after the 3 day holiday, the US dollar may continue to struggle for some time to come, as the FED statement provided little in the way of comfort or support for the US currency, which is now favoured over the Japanese Yen as the carry trade curency of choice. However, we may be reaching a point where the BOJ may decide to take some action to protect their exporters. According to various analysts Japanese exporters already find the 90 price handle difficult, their preference being 95, so the price action at current levels will be both fierce and volatile. The only item of fundamental news on the economic calendar for Japan was the month on month All Industries Activities report which measures the change in the total value of goods and services purchased by businesses. The headline number was 0.5% against a forecast of 0.8%. All the fundamental news for the US dollar can found on the eurodollar site.